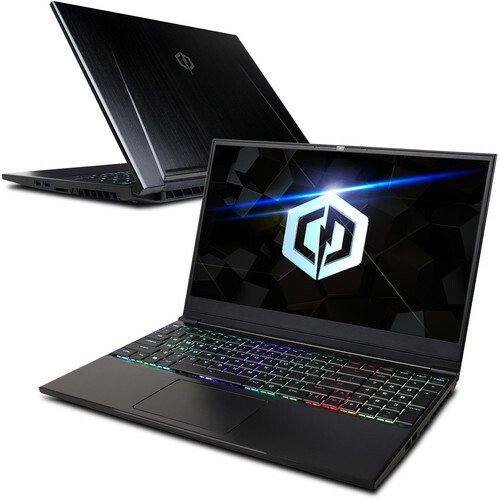 The 15.6" Tracer III Slim VR Gaming Laptop from CyberPowerPC is packed with hardware capable of tackling everyday tasks and playing graphically demanding games. Specs-wise, it's equipped with a 2.2 GHz Intel Core i7-8750H six-core processor, 16GB of DDR4 RAM, a 512GB NVMe PCIe SSD, and an NVIDIA GeForce RTX 2060 Max-Q graphics card. To top it all off, the Tracer has a 15.6" 1920 x 1080 Full HD IPS display with a 144 Hz refresh rate that's ideal for fast-paced action games. Other integrated features include Gigabit Ethernet, 802.11ac Wi-Fi, Bluetooth 5.0, USB Type-A and Type-C ports, HDMI and Mini DisplayPort outputs, and audio in/out jacks. The operating system installed is Windows 10 Home. RGB aesthetics-aside, the keyboard has programmable mechanical keys that you can customize as needed while also providing you with a more comfortable typing experience. A fast 144 Hz refresh rate helps to reduce blur and ghosting for fluid and responsive experience whether you're watching videos or playing games.